Posted by admin on July 16, 2010; This entry is filed under China, Chongming Island, Design Role Analysis, Project Introduction Text, Shangai, Xianqiao Village, Xianqio Village > Chongming Island > Shangai > China. The Chongming Sustainable Community project aims to to improve the living conditions in the Chongming countryside community and to promote its sustainable development. Considering that Chongming is an island of farms and woods very close to Shanghai, the project main strategy is to promote a set of initiatives, both in Chongming and in Shanghai, in order to turn their proximity in a mutual advantage. In this larger framework, the project started promoting several local project in the area of a village, the Xianqiao Village, taken as pilot case. The Chongming Sustainable Community project has been initiated in the 2008 by Tongji Unviersity and Studio Tao. It is an interdisciplinary project promoted and supported by a multiplicity of actors. With an interdisciplinary method, different design specialists, such as urban planners, architects, interior designers and strategic and service designers, collaborated with other experts and local stakeholders in order to build a shred vision and some specific coherent projects. Up to now (summer 2010), several activities have taken place, both in Chiongming and Shanghai and in he project team succeeded in gaining the trust and support of the local government and residents, mobilizing diverse academic and commercial resource, motivating a multidisciplinary collaboration, including urban planning, environmental science, design, etc. In the nowadays China who is recently recovered from the global financial crisis, the agriculture is not seemed to be a popular topic. While beneath every popular topic, the images of the agriculture, the countryside and the farmers could be found easily. For example, when we are talking about the transformation of the economic model, it is acknowledged that the precondition of the existing manufacture-exporting model is the vast countryside population in China which is the main part of the low-cost labor resource. Behind the rapid urbanization process is the morass of the farmers who lost their farmland. The headstream of the frequent food security accidents is often the pesticide abuse. And in the discussion of the environmental issues, such as soil degrading and water pollution, the next step of the industrialized agriculture should be reflected. The Chongming Sustainable Community project is a pilot experiment in this macro social/economic background. Backing on the biggest Yangtze River Delta metropolitan cluster, the Chongming area reflected all kinds of problems in the Chinese countryside: it located in the Yangtze River estuary, the transportation between the island and the mainland is quite inconvenient. Comparing the vast acreage of the island, the infrastructure of transportation, health care and education is inadequate. Because of the poor efficiency of farming, more and more farmers immigrate into the city for work. Although the average income of the island residents is relative higher than other areas, there is still a huge difference between the city and the countryside. In this larger context, the Xianqiao Village, which is located in the middle of the island, has been chosen as pilot case. Here, the average income and the farmland acreage are on the average level. Since the low efficiency of farming, most of the young male villagers are working in the Shanghai city. Every family owns a piece of farmland of circa 1 mu (about 667㎡). Since only elder, female and children are left in the village, the villagers’ association helps the farmers to cultivate and harvest the crops collectively. Almost every family has an independent house, and the front/back yard is generally cultivated as a vegetable garden, so that the basic demands could be self-sufficient, while the spare products would be sold in the market 2 miles away. The project general aim is to support the Chongming community enhancing the agricultural productivity, improving the infrastructure (of transportation, health care, education, etc. ), revitalizing the social fabric. In order to get these results, its natural resource and geographic position are considered the project strategy starting: more than 2/3 of Chongming island are dominated by farmlands and forests. With the promotion of an advanced diversified agriculture, these resources could become an important production base of the organic food for the Shanghai City. Furthermore, with the improvement of the transportation facility (the Shanghai Yangtze Bridge, the planned railway), the island could become the preferential resort “o-mile” destination the Shanghai citizens. To move in this direction, the concept of “rururban” (rural-urban area, Buchanan,1992) has been introduced and integrated with the Chinese ancient idea of Yin-Yang (Lou&Diaz, 2009): the countryside provides food for the city, while the active participation to agricultural activities could improve the citizens’ quality of life, as well as bringing the needed economic resources to the countryside. The rural and the urban can generate a new form of symbiosis where they complement to each other. In particular: with an efficient distribution system, the agricultural and tourism resource would be more accessible to the citizens. When the potential demands on better food and air were satisfied, the farmers could gain more income and the overall environment will be improved. At the same time, the expending employment opportunities could be attractive for the young, educated generation, thus a self-standing sustainable community could be expected. The territorial resource analysis is the starting point of the design and planning process. The project team did field research in Xianqiao Village, which is a representative of the Shanghai rural area. Most of the farmland is used for crop planting, with some complement of vegetable and fruit. Different kinds of poultry and animals are raised scatteredly, most of which are only for the family needs. Being close to the most developed area in China, the traditional culture is disappearing except the local cuisine. Most of the architecture was built in the past two decades, and almost no monument is discovered. However, some elder villagers still keep handicraft skills, such as basket weave, honey making, homemade pastry. Even they are not popular in the village, they are still recognized as a part of the immaterial resource. With the design process, these tangible and intangible resources will be organized in a feasible, innovative way. From 2009 to 2010, several thematic workshops were held on enclosing to the topic of sustainable community, including the rural public space, the rural kitchen and creative economy. Some international design schools have been involved in the workshops. With a global view and in a totally local context, the workshops carried out co-design activities and produced plenty of feasible proposals. The workshop of the rural public space was the first international workshop for this project. The aims were, firstly, to find out the spare space in the village, planning to reuse them especially for the public life for the villagers. Secondly, to modify the existing farming plan, in order to improve the agricultural productivity and the farmers’ income. Just like most of the villages in China, there are few facilities for the public life in Xianqiao Village. The present community center is used generally for the committee’s meeting and occasionally as a projection room for the villagers. Some simple gymnastic equipments are fixed in the courtyard of the community center, while only children will use them after school. The redesignated community center will be a multifunctional center for all of the villagers, particular providing public service, such as information service and primary health care aiding. With the future vision of agritourism, a panoramic plan for the village was proposed by the workshop. A better streetscape with basic outdoor furniture could not only improve the living condition of the villagers, but also make the village more attractive and friendly to the visitors. The second task of the workshop was to rearrange the farmland. Since the collectively cultivated farmland was proved to be low efficient, a well planned plant chart will be helpful for the villagers. Having reserved enough space for the crops, some farmlands could be cultivated diversely with different seasonal plants, including vegetables and fruits, which could improve the farmers’ income evidently, meanwhile the monotonous landscape will be improved naturally. Followed the rural public space workshop, a more specific workshop was held in September 2009. With a rapid process of urbanization, the Chinese tradition has been diluted no matter in urban or in rural, with an exception of the cuisine. Eating remains its importance in the everyday life, so that the kitchen could be an interesting portal to observe the lifestyle. In the Xianqiao Village, most of the villagers have built their own houses in a mixed western style. In general, there is a well-equipped modern kitchen with an affiliated traditional kitchen, or with the traditional stove in the same space. The reasons for this reservation are, firstly, it is more economic to use the traditional stove, since the fuel, such as hay, woods, is free for the villagers. Contrarily, the gas or electric will be quite an expense for them. Secondly, it is thought that the food which is cooked with a traditional stove is tastier than the gas-fired stove. Therefore, if only there were visitors, most of the villagers insist to use their traditional stove. The rural kitchen is not only for the redesigning of the kitchen itself, but also for the reorientation of the lifestyle. Besides the basic function-cooking-of the kitchen, it is also a space of the reunion of the family and a place for the casual meeting of the neighbours. In addition, with the expectation of agritoursim, diverse functions should be considered to meet the visitors’ demands. 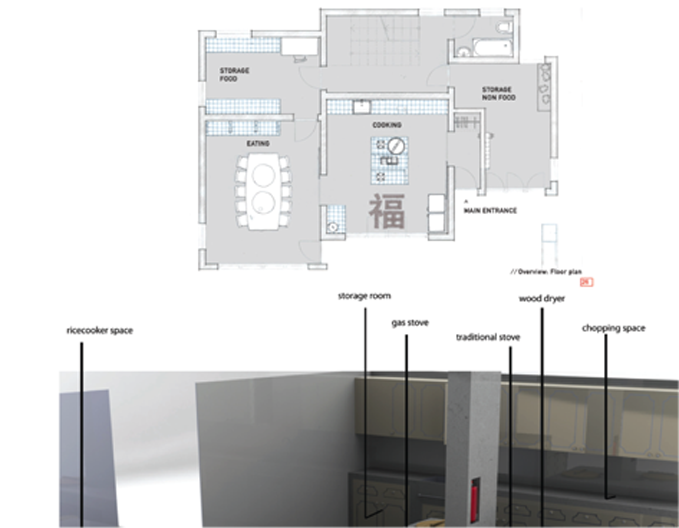 It is an interior-service design task with possible expending of the outdoor space planning. Six international teams were constituted by students with different backgrounds (architecture, interior design, industrial design, sociology, mechanical engineering and landscape planning). The research topics started from ‘kitchen’ while expanded to a macro scale, including industry/business, architecture/environment, energy/waste, tools/craftsmanship, lifestyle/service and communication. Both the rural public space planning and the redesign of the rural kitchen are the reconstruction of the existing living condition, which both mainly aimed to the improvement of the infrastructure. However, in order to figure out the sustainable mode of the village, possible commercial opportunities will be the urgent but practical issue for the project. In the past decades, the general model to boom the rural area is introducing investment on manufacture. Being employed by the local factories, the villagers could have an expectable income besides farming. But few of these enterprises could be operated successfully because of the small scale and low efficiency. In Xianqiao Village, there was a textile miller which has moved to the town a few years ago. The water pollution was the reason of the transfer. Consequently, the fragile ecological condition of the village requests cautious but innovative solution for the economic development. In the network society, the method of maximizing efficiency is to collaborate with each other and involve all of the roles actively. Even dealing with different topics, the design groups tried to create synergy. For example, Bio Ming, the food company could provide traditional Chinese herbs to the H+ Company (health). When Renmu (hospitality) designs diffused accommodation for the visitors, some space could be specifically reserved for the organic food restaurant (Ping Heng Dao). By sharing operations and infrastructure, different enterprises would reinforce and complement each other (Meroni, 2010). These thematic workshops are not only for design didactic and research, but also for the proposal generation of the projects. Potential business partners could be attracted during this process. Meanwhile the villagers and the local government could have better understanding on the territorial ecology by social learning. 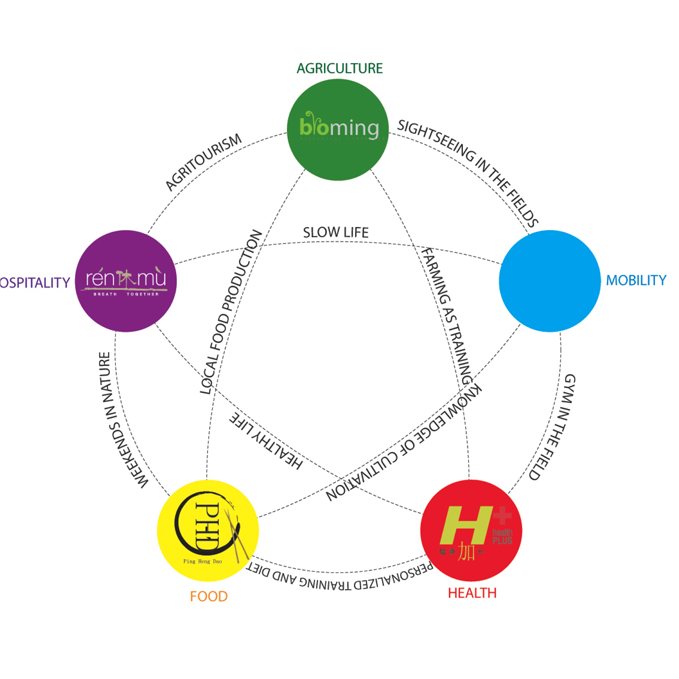 The Chongming sustainable community project is a design driven project. It comes from the vision of sustainability, the insight of the present context and the understanding of the particularity of the area. Being mediators between providers and users, designers’ role is the one of mobilizing the social capital proposing comprehensible, viable, attractive scenarios and solutions. All the roles, or the stakeholders, will be motivated by the design activities and solutions. Given that, the key issue is the quality of the scenarios and proposals and how much the stakeholders could be activated. In particular, the collaboration between the villagers is one of the objects of the sustainable community project. In the populous village like Xianqiao, the resource owned by every family is quite small, such as the vegetable garden, spare room, labor, skill, etc. The profit will be quite limited if every family works separately. However, when the project is planned as a whole and initiate the collaboration of the villager by sharing resource, the marginal utility will exceed the sum of the individually works. Therefore, the mutual understanding of stakeholders will somehow orient the direction of the project. And it is one of the main difficulties of this project. Most of the village residents are less educated elder and women, some of whom only speak the Chongming dialect and could not understand the mandarin, How to satisfy the latent requirements, and how to involve them into an active co-design process, therefore trigger the social entrepreneur among the villagers challenge the designers’ creativity. 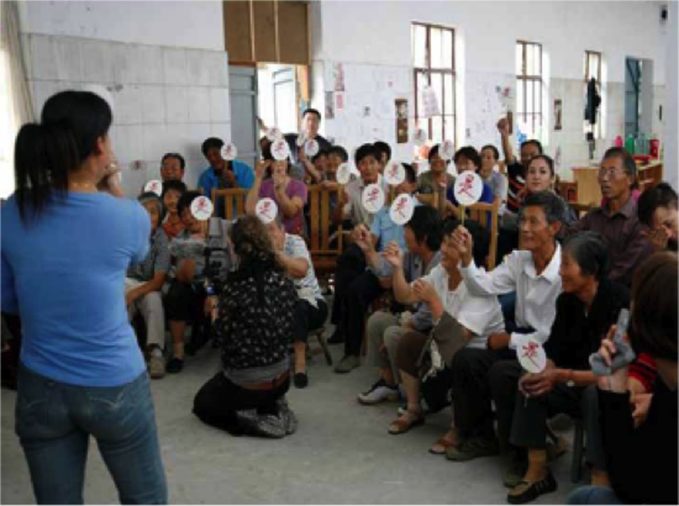 Considering the huge urban-rural gap in China, the method of activating community into the co-design activities will be a significant theme for the design researchers in China and other developing areas as well. The design for territorial ecology is an emerging subject in the design arena. Being a pilot case in China, the Chongming sustainable community project aims to build a prototype in China, and search for a feasible solution of the sustainable development for the rural area. New design thinking and methods are catalyzed by generating and operating the project. It is a creative experiment for not only the social innovation and the design research itself.